Know-how, creativity and style – these are the qualities that spring from Smeg's Italian identity and characterise the brand’s commitment to bringing everyday objects to life. 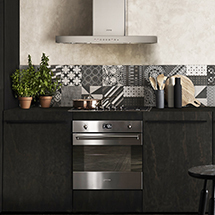 Smeg's range encompasses freestanding cookers, built-in ovens, steamers, microwaves, warming drawers, coffee machines, cooktops, rangehoods, sinks, dishwashers, and refrigerators. Smeg is synonymous with the iconic FAB retro-style fridge. Available in exciting colours and designs, a Smeg FAB fridge is always the hero of a styled kitchen or interior. Smeg also offers side-by-side or French-door models in stunning fingerprint-resistant stainless steel. View the Smeg Classic catalogue here.